“What is your vision for Madagascar?” That was the main question posed to the 30 participants of Civics 2.0, an #AEIF2018 project that promotes responsible citizenship and civic education for Malagasy youth. 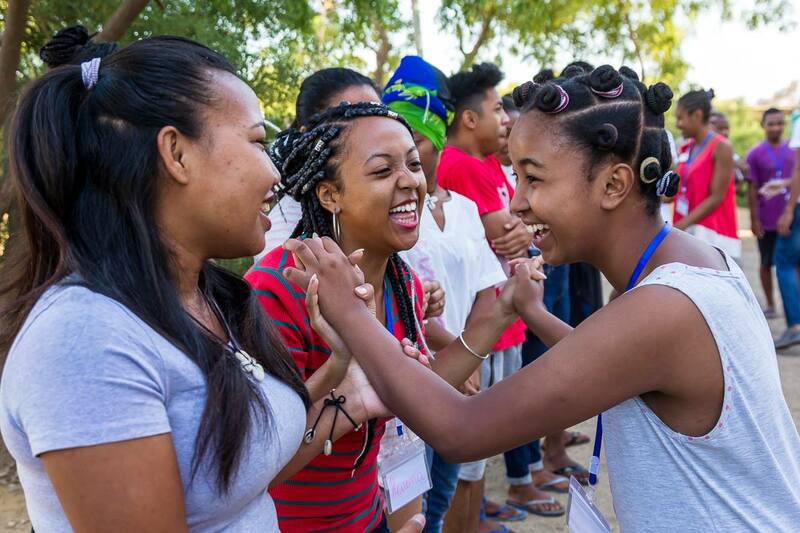 During the final months of 2018, 30 young people (aged 18-23) from all over the island nation of Madagascar honed their leadership skills in the program’s camp, country tour, and closing conference. The three #ExchangeAlumni team members working on the project are alumni of the Mandela Washington Fellowship for Young African Leaders, where they each expanded their expertise on community engagement, youth empowerment, and civic activism. The Civics 2.0 journey began when participants hopped on a bus heading from their homes to Toliara, a coastal region on the Mozambique Channel. The weeklong leadership camp provided a unique interactive, hands-on education that the majority of students had never experienced in the prescribed educational system in Madagascar. Each morning, the students dove into “setting a vision for Madagascar.” Through educational games, simulations, problem solving, and quizzes, campers learned about democracy, elections, and fundamental rights. Afternoons at camp were dedicated to community outreach and visits. The campers took initiative to clean up the “Jardin de la mer (Garden of the Sea),” one of the most popular beaches in the area for local youth. The locals congratulated and thanked the campers for their commitment to serve the community, especially since they were newcomers to the region. The participants also explored the diversity of Madagascar, a culturally rich country influenced over the centuries by cultures ranging from East Africa, Southeast Asia, Arabs, British, French and Chinese. Each student performed a cultural act from their respective region for a local audience. The campers learned about Malagasy heroes and met local activists, and they finished off the camp with a meeting with a high counselor from the Atsimo Atsianana region. The campers utilized this meeting to discuss some of the issues that they witnessed while in Toliara, such as poverty and environmental concerns. After the weeklong camp, the students continued on the Civics 2.0 Tour, where the bus made its way over to the east coast of the island. During the tour, the students met with locals at Isalo National Park to discuss issues with bushfires, sang the national anthem in the public square of Ranomafana Town, cleaned up the playground of a local high school, and visited the tropical rainforest in Ranomafana National Park. The students met with several organizations that were dedicated to protecting the rainforest, but they were surprised to find out that foreigners ran most of these initiatives. The students were eager to encourage members of their own community to get involved with ecotourism and conservation. The Civics 2.0 project wrapped up in late December with a closing conference that brought together the lessons of the camp and the country tour. After spending 16 days together, the students made a pledge use the new tools and concepts back in their home regions and communities. Each of the students are continuing on their journeys of becoming active citizens. Are you feeling inspired by the Civics 2.0 project? Now is the perfect time to sign in to your alumni.state.gov account, find your AEIF team and submit a project on Building Civic Participation, Good Governance, and Resilient Communities. Don’t wait! Submit your application starting on February 1.